Dr Stephen Hurt, Reader in IR, Oxford Brookes University, UK. Over recent months, international media coverage has portrayed South Africa as a ‘broken’ country. Only this week we have seen on our TV screens evidence of serious police brutality, which reminded me of many of the images from the 1980s that had such an impact on me as an impressionable teenager. Similarly, in August 2012 we watched in horror as striking platinum miners in Marikana were shot dead by police. 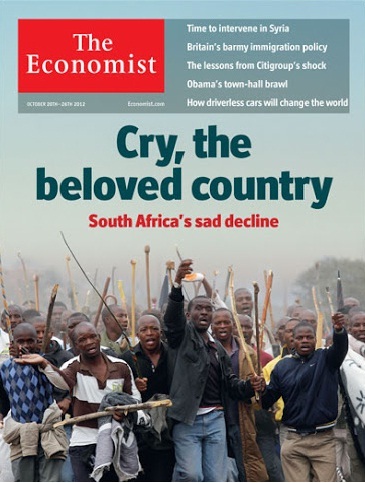 Such events have generated a ‘declinist’ reading of the situation in South Africa, most aptly demonstrated by The Economist on the front cover of its non-UK edition in October 2012. What is striking here (no pun intended) is that such views contrast quite sharply with the orthodox narrative used to depict developments in the rest of the African continent in recent years, which points to rapid rates of economic growth in a number of countries (in particular Angola and Nigeria) that in 2011 were dubbed ‘African Lions’ in the very same publication. It seems that South Africa is being singled out as an isolated case in a continent that is otherwise making economic advances. This perception provides the flip-side to earlier suggestions that Africa was the ‘hopeless continent’ when again South Africa was described as the exception to the rule. Inside the 20th October 2012 issue the two articles ‘Cry, the beloved country’ and ‘Over the rainbow’ paint a worrying picture of the situation in South Africa as it approaches the end of two decades since the first multi-racial election. The assessment of what has gone wrong since 1994 suggests that the major causal factor has been the incompetence of the African National Congress (ANC), which has led the government throughout the post-apartheid period. Former President, Thabo Mbeki, and current incumbent Jacob Zuma, are charged with leading a party that has fostered corruption and has failed to attract the foreign investment needed to address rising inequality and the grinding poverty that is the daily existence of the majority of the population. The main opposition party, the Democratic Alliance (DA), are claimed to have the ‘right ideas’ and striking miners are seen as a serious dent to South Africa’s reputation as a potential investment opportunity. Whilst such analysis correctly identifies the key tensions in South African society – inequality, unemployment and poverty – and notes some of the undoubted failings of the ANC, it fails to identify the ideological alignment of the ANC government to neoliberalism and the place of South Africa within global capitalism as key parts of the ‘problem’. In this sense I was reminded of an article by John S. Saul entitled ‘Cry for the Beloved Country: The Post-Apartheid Denouement’ published back in 2001 in the Monthly Review. Here Saul emphasises, as many have done, how the negotiated transition to democracy was designed as a way to organise the handover of political power to the ANC, whilst at the same time maintaining the continuity of capitalist economic relations and an acceptance of the dominant neoliberal orthodoxy. Saul’s conclusion that the transition has failed to address the underlying social relations within South Africa, despite being made over ten years ago, looks ever more pertinent as each year passes. The central premise of both the ANC’s economic strategy, and the analysis presented in The Economist, is the need to attract foreign investment to South Africa through a policy framework designed to create a set of business-friendly conditions. What is not questioned, however, are the potential consequences of such an unrestrained engagement with the global economy. It is this ideological side to the ANC’s hegemony within South Africa that is often ignored by those who focus on the more coercive measures adopted by the state to quash displays of discontent amongst South Africa’s justifiably impatient majority. Whilst it is certainly true that South Africa needs a more effective government than the one it currently has, it also requires a significant shift to the left in ideological terms if it is to address such divisive socio-economic inequalities. It is becoming increasingly apparent that despite the removal of Mbeki, this is not possible within the confines of the ANC. The DA who argue in favour of the need for ‘an economy that is characterized primarily by the free choices of individuals’, offer little in the way of a genuine alternative, except for a potentially more efficient and less corrupt neoliberal state. The need for change runs much deeper than the mainstream declinist critics of the ANC government suggest.